This motel has 2 floors in 1 building and offers wheelchair access. Amenities include designated smoking areas. Make use of convenient amenities such as wireless Internet access (surcharge), a television in a common area, and a reception hall. 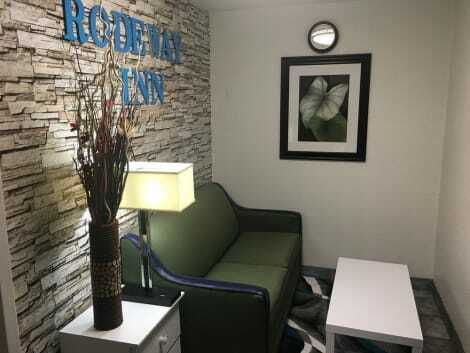 Featured amenities include a 24-hour front desk, laundry facilities, and microwave in a common area. Free self parking is available onsite. Featured amenities include a business center, express check-in, and express check-out. Planning an event in Hays? This hotel has 350 square feet (33 square meters) of space consisting of conference space and a meeting room. Free self parking is available onsite. Featured amenities include complimentary wired Internet access, a business center, and express check-out. Planning an event in Hays? This hotel features 1540 square feet (139 square meters) of event facilities. Free self parking is available onsite. A complimentary buffet breakfast is served on weekdays from 6 AM to 9 AM and on weekends from 6 AM to 10 AM.